We are delighted to announce that Stay With Me has been shortlisted for the 2017 Baileys Women’s Prize for Fiction. Read more about the ‘daring’ and ‘intimate’ shortlist on the Baileys Prize website here and on the BBC website here. 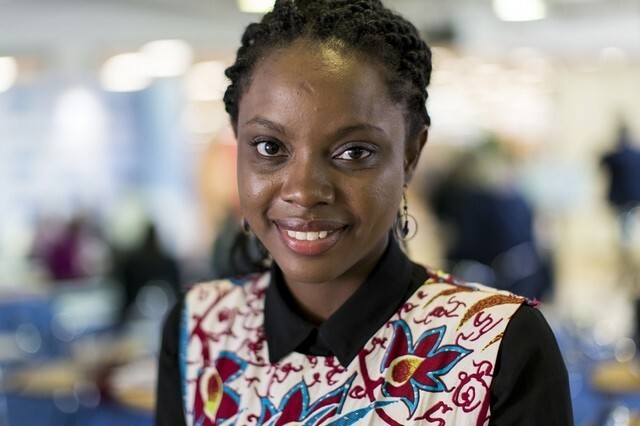 Read interviews with Ayobami in The Bookseller and The Guardian. Nigerian debut novelist Ayọ̀bámi Adébáyọ̀̀ has been shortlisted for the £30,000 Baileys Women’s Prize for Fiction for her work Stay With Me (Canongate), alongside Man Booker shortlistee Madeleine Thien and one previous winner of the prize, Linda Grant. The shortlist was announced this evening (3rd April) at an event at Waterstones, Tottenham Court Road in central London, hosted by novelist and co-founder of the Baileys Women’s Prize for Fiction, Kate Mosse. Nigerian writer Ayọ̀bámi Adébáyọ’s book – the only debut on the shortlist – Stay With Me is set in 1980s Nigeria and delves into the fragility of married love and the undoing of a family when a choice is made after a couple has trouble conceiving a child. Thien’s third book Do Not Say We Have Nothing, about the plight of musicians during the Cultural Revolution in China, was shortlisted for the Man Booker just a few months after it published. It became the bookies’ favourite until Paul Beatty ultimately won the award with The Sellout (Oneworld) in October, and it went on to win the Scotiabank Giller Prize 2016 and the Governor General’s Award 2016. Thien’s story begins in Vancouver, where a 10-year-old and her mother invite a young woman into their home who has fled China in the aftermath of the Tiananmen Square protests. Fellow Granta author Gwendoline Riley has also been shortlisted for her sixth novel First Love. Despite its romantic-sounding name, First Love, about a writer in her mid-30s married to an older man, is billed as “a blistering portrait of a marriage in crisis” and “a story of helplessness and hostility”, probing memories of a bullying father and a self-involved mother. With Adébáyọ̀̀, Thien and Riley’s novels published by independents, the other half of the shortlist is published by larger houses. Penguin Random House has one book in the running (Viking), as do Hachette (Virago) and HarperCollins (4th Estate). Linda Grant, a Man Booker-shortlistee and one of the prize’s first winners, is shortlisted for her post-war story of tubercular east London twins, The Dark Circle (Virago). She won the prize in 2000, when it was then known as the Orange Prize for Fiction, with When I Lived in Modern Times (Granta). Naomi Alderman makes the running for her feminist dystopia The Power (Viking), which imagines a world where women gain the power to electrocute at will. TV rights in the book, Alderman’s fourth, were at the centre of an 11-way auction and a long-running, global television series is now currently in the works with Sister Pictures, co-producers of ITV’s “Broadchurch”. Alderman won the Orange Award for New Writers and the Sunday Times Young Writer of the Year Award, and is also the co-creator and lead writer of smartphone audio adventure app, Zombies, Run!. Half of the novelists on the shortlist are British, and the only American author in the picture is CE Morgan, whose shortlisted second novel The Sport of Kings (4th Estate) is both about horse racing and about race. Morgan, who lives in Kentucky, bases her multigenerational story on its “bloody past”, while following a father and daughter who try to mould a wilful thoroughbred into a champion. The judges for the award – Tessa Ross, c.e.o. House Productions, Sam Baker, co-founder of The Pool, broadcaster Katie Derham, author Aminatta Forna, and comic and author Sara Pascoe – said it was a “quite a challenge” to cut down the 16-strong longlist down to six titles, but that the shortlist comprised novels that “stayed with all of us well beyond the final page”. The award ceremony announcing the winner will take place in The Clore Ballroom, Royal Festival Hall, Southbank Centre, London, on 7th June 2017.